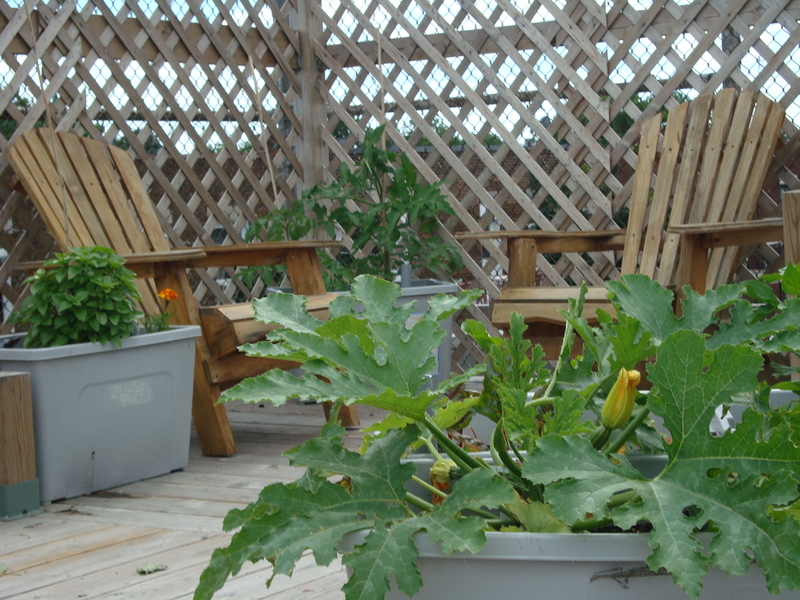 The Dawson Rooftop Garden entered its second year of production in 2012 – and it’s bound to be a fruitful season! Built in October 2010, a group of volunteers transformed the Dawson Community Centre’s roof into a wide-open terrace – complete with picnic tables and Adirondack chairs – overlooking the Desmarchais-Crawford neighbourhood in Verdun. The garden aspect is comprised of 40 self-watering containers, which are currently choked full of vegetables, herbs, and flowers. Back by popular demand, we are growing ground cherries and many varieties of tomatoes, summer squash, cucumbers, and zucchini. Nasturtiums, lettuce, celery, and plenty of basil fill in the garden containers as well. As a collective garden project, the Dawson Rooftop Garden welcomes all those interested in gardening to come help tend the plants. In fact, the garden needs you! While getting your hands dirty, you’ll learn gardening techniques and get to share in the harvest that day.. Volunteer work parties are every Tuesday from 10am – 1pm. Everyone is welcome – no experience necessary – bring your family and friends! This summer young children and youth are learning about gardening, biology, food production and preparation, along with related environmental, health, and economic issues through programmed activities on the rooftop garden. The rooftop garden is also open to other day camps and groups – contact us to set up an appointment today!